Renée French has been making comics since the early 90s. Most of her early stories were collected in Marbles in My Underpants: The Renée French Collection, from Oni Press. Her weekly strip The Taint can be seen at www.nypress.com, and some of her short works can be found in Rosetta, The Ganzfeld #2 and #3, Kramer's Ergot, and Top Shelf Asks the Big Questions. 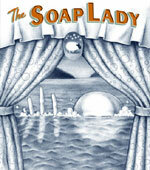 Her projects with Top Shelf include the critically-acclaimed The Ticking, Micrographica, and The Soap Lady. She lives in the bay area with her husband, Rob, and a hermit crab. FINALLY, RENEE FRENCH'S MASTERPIECE IS BACK IN PRINT!